While the subject of Da Vinci’s famous Renaissance painting is likely identifiable as Lisa del Giocondo, a.k.a. Lisa Gherardini, her enigmatic expression has captivated generations. Medieval art has its own enigma: the woman featured in the Lady and the Unicorn tapestries. This tapestry set contains some of the most well-known images from medieval art, yet many details about the six textiles are still unknown. Some viewers consider them the epitomy of the romantic medieval allegory, while others see the beginning of the Renaissance by engaging with the natural and scientific world. The tapestries, created around 1500 a.d., are on permanent display at the Musée de Cluny (Le Musée National du Moyen Âge – Thermes et hotel de Cluny) in Paris. The high quality of the design and production has always marked this set as special, however it is possible that one or more tapestries is missing. Five of them represent the five senses (according to most interpretations), while the sixth known as À mon seul désir (My only desire) is puzzling. The main characters are a noble lady, a unicorn, the lady’s attendant, and a few featured animals. While the dresses are mostly contemporary with other tapestries, their hairstyles are a bit of mystery in certain scenes. The action in Mon seul désir is difficult to determine as well; is the lady taking jewels off as if transitioning into a simpler life? Or is she taking jewels out of the coffer and selecting her accessories? The unicorn plays various roles throughout the series. In the tapestry representing Touch, the lady sensually grips the unicorn’s horn while it gazes at her. In Sight it quizzically observes its reflection in a mirror held by the lady while the unicorn reposes on her lap. Sometimes its role is more removed, such as in Sound/Hearing while it passively listens to the lady playing an instrument, or Taste when the unicorn holds a banner watching the lady delicately feed a bird on her hand. “Sight.” In repose on the Lady’s lap, the unicorn gazes at his reflection. In medieval literature, this was the prescribed method to capture the crafty and elusive unicorn. Most of the other animals play a passive role. A few are somewhat engaged with the central characters (more on that below), while some help set the scene like an extra on a film set. The fox, rabbit, genet (a small wild feline species), falcon, and heron were animals commonly hunted in the Middle Ages and represent the realm of the nobility and royalty. More animals roam the background including a dove and a grazing goat. They have their own medieval symbolism too, however they don’t contribute to the main storyline in this context. A taxidermied genet displayed nearby the tapestries. The inclusion of animals as supporting characters is more direct than in many other medieval tapestries and illustrations. While the Lady’s experience of the senses is the primary narrative, the animals’ experience of the senses plays a supporting role. The unicorn, the Lady’s dog and the monkey are all key players, and have more agency with the viewer compared to the Lady’s human companion. This awareness of how other species might engage with the world is a relatively unusual perspective for a medieval artist, and contributes to the debate about the tapestries’ meaning. It’s one piece of evidence which causes some scholars to see the tapestries as a Renaissance artwork rather than medieval. The genet in “Touch.” Can you see its recognizable spots? While the figures are rich with medieval symbolism, the background of these textiles is actually one of the most important features. The central scenes are surrounded by a detailed millefleurs (literally, thousand flowers) design which includes over 40 species of flowers, grasses, leaves, and other botanical components. The most common flowers are the digitalis, the blue columbine, marguerite, and carnation. The millefleurs design is seen in other tapestries from the late 15th and early 16th centuries, and this focus on the natural world is also seen in contemporary manuscript illuminations. The vibrant colors in these elements contribute to the rich aesthetic of the overall set, and directly flaunts the wealth of the original owner with its array of colors and expensive materials. “Taste.” The Lady feeds a bird from her hand while the unicorn prominently displays the Le Viste arms. The repeated coat of arms, the triple crescent on an azure sash, connects the tapestries with the Le Viste family. This prominent noble family held roles in the Paris Parliament and was well-connected with French royalty. The crescent is prominently featured, even included as a repeating pattern on the bright blue poles holding the banners. The reason for the tapestries’ creation is not known, nor is their place of production and design. It is possible that they were designed by an artist known as the Master of the Très Petits Heures, who was active around 1500 a.d. and produced the Très Petits Heures devotional manuscript for Queen Anne of Brittany. Hidden away as furniture storage pads until 1814, the wool and silk tapestries have been admired and studied since their discovery in Boussac Castle in Creuse. Inspector General of Historic Monuments Prosper Mérimée wrote about them in 1841, and notorious author George Sand was inspired by their mystery (or perhaps just through her lover Mérimée!). They have been in the possession of the French government at the Cluny since 1882. 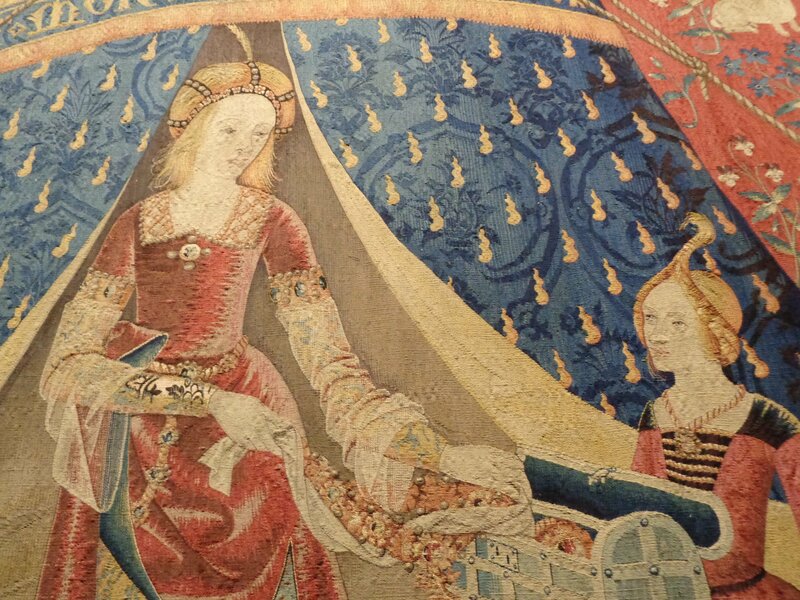 Now, thousands of visitors visit the Cluny just to see these iconic textiles. “Scent.” The Lady examines a basket of flowering blooms presented by her companion. Close by, the monkey delicately sniffs a flower from another basket. The tapestries are the subject of multiple novels, including Tracy Chevalier’s The Lady and the Unicorn or Kelly Jones’ The Seventh Unicorn. Their characters have entranced many viewers, confused medieval historians, and inspired artists. The Lady and the Unicorn tapestries are rightly considered one of the most important treasures remaining from the Medieval period, and will continue to entrance and mystify with their romantic, whimsical, enigmatic nature. The Lady’s faithful dog, present in all six tapestries, hopefully watches the Lady in “Taste.” The begging pet: a familiar sight in any age! All photos taken by D. Trynoski at the Musée de Cluny (Le Musée National du Moyen Âge – Thermes et hotel de Cluny), Paris, 2014. Is there a Sixth Sense in the Lady and the Unicorn Tapestries? “Touch.” The Lady grips the unicorn’s horn. This was a relatively common metaphor in medieval literature for grasping a particular part of the human male anatomy, so some theories about the tapestries postulate that they were intended to celebrate a marriage in the Le Viste family and all the duties that come with it. “Hearing.” The unicorn and the companion listen while the Lady plays them a tune.